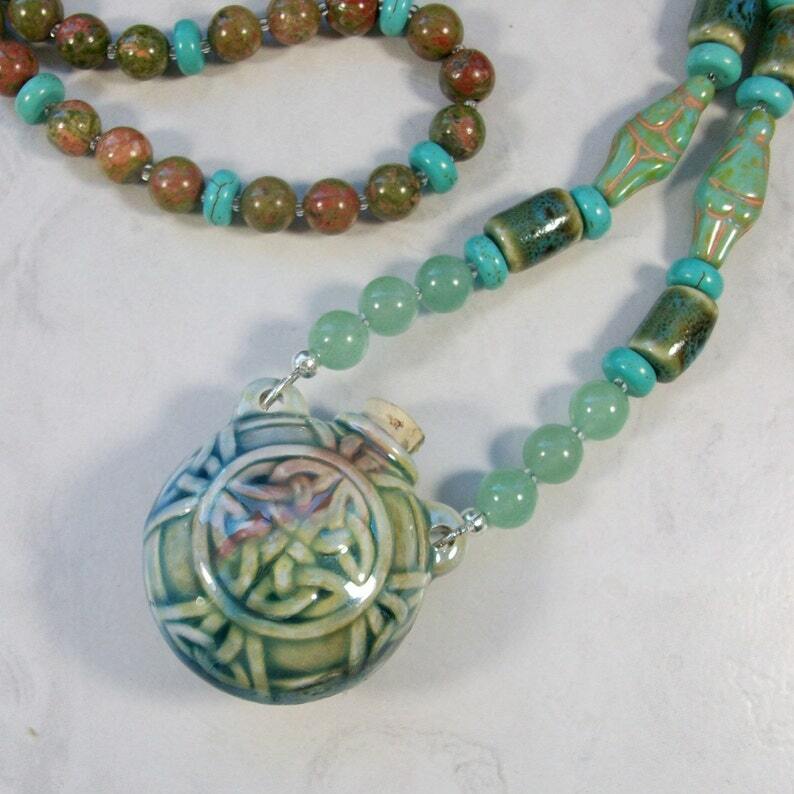 I’ve suspended a beautiful blue green Raku glazed Celtic knot bottle vessel pendant with a 30” (760mm) strand of blessed stones. Flanking this pendant on both sides are 8mm orbs of green Aventurine, rondelles of Turquoise and Angelite, Turquoise glass Venus of Willendorf beads, Raku barrels and discs, iridescent glass spiral discs, 14mm black 3-D Scottie fairies with silver plated pewter wings, and finishing with triads of 8mm Unakite Jasper orbs spaced with more Turquoise rondelles. There is no clasp on this necklace as it easily slips over your head so you can either wear this piece or hang it in your room. The Celtic bottle has a cork in it so you can fill it with a potion or scent of your choosing. All Gibscot orders arrive at your door, via USPS Priority Mail, securely packaged and elegantly presented for gift giving either for yourself or someone else special in your life. Shipping charges include an elegant jewelry box with imported tartan ribbon bow. Upon request, a handmade gift tag can be included at no extra charge. Angelite (Blue Anhydrite): The color of light-blue angelite relates it to the fifth (throat) chakra, which governs communication. Turquoise colored Angelite helps in team building and group cohesiveness for the achievement of goals and dreams. Aquamarine color helps us to express our deepest spiritual truths. Helpful in telepathic communication. As its name suggests, it helps in communication with angels. You can also use it to connect with your animal spirit guides. Assists in healing anger. Aventurine: A form of quartz, Aventurine can be found naturally in green, pink, orange, brown, yellow, blue, purple or gray. Said to benefit one in all areas of creativity, and imagination, as well as intellect and mental clarity. Enhances prosperity and brings career success. It is a gentle stone energetically that gives a sense of calm and balance and enhances happiness. It also helps one to see alternatives and potentials in all situations, giving a positive outlook, courage and inner strength. It is also said to bring luck, especially in games of chance. Associated with the heart chakra. Green Aventurine is a mystical stone of prosperity and gentle protector. It is a comforter, all-round healer and general harmonizer, bringing in well-being and emotional calm. This stone assists in establishing exactly what makes you happy or unhappy. Traditionally, it was worn to strengthen eyesight and used as a gambler’s talisman. Associated with both heart and spleen chakras. Turquoise: Sacred to both Native American and oriental traditions. It is associated with the sky, and bringing sky energy to earth. It can help promote honest and clear communication from the heart. It is also said to protect against pollution in the environment, and to bring abundance. Turquoise can also help speed the healing process, and is known as a master healer stone. It is very powerful for grounding and protection. Unakite: A stone with gentle but powerful energy. It is a stone of vision that balances emotions with spirituality and opens the third eye providing grounding after meditation or metaphysical work. This stone facilitates rebirthing, bringing to light and integrating insights from the past about the cause of blockages, and gently releasing conditions that inhibit spiritual and psychological growth. It is helpful in past-life healing for going back to the source of a problem and reframing it, clearing a need for vengeance if required.